In the Hero I-League round eleven opener at the Rajiv Gandhi Stadium, Aizawl FC avenged Chennai City FC defeating them, thanks to the solitary goal scored by Brandon Vanlalremdika (53′) in the second half. The home side maintained a comfortable possession in the first half but they were unable to secure themselves a lead in spite of a flurry of attacking moves that could have been executed better by the forwards. The away keeper, Karanjit Singh was troubled by the hosts quite a few times. Jayesh Rane’s corner kick was headed towards the goal by Zohmingliana but Karanjit managed to punch it over the bar. Karanjit had also blocked Al Amna’s free kick just minutes into the match. The first shot by Khalid Jamil’s boys came in the 12th minute when Alfred Jaryan made a shot for the net from outside the box. Karanjit easily thwarted the attempt. Chennai City FC gave the home side quite a hassle from a counter-attacking move. Denson Devadas unleashed the ball to Charles de Souza who charged forward with the ball. However, Aizawl FC defender Kingsley Eze blocked the Brazilian forward. The second half kicked off to an invigorating start. R. Laldanmawia received Al Amna’s pass and took a powerful shot, only to be denied by the woodwork. Brandon, on his way to scoring his third goal of the campaign, converted an assist from the right by Ivorian forward Kamo ten minutes into the second half. Alfred Jaryan displayed his extraordinary skills once again as he nearly secured another goal for his side when he delivered a long and powerful shot but Karanjit Singh averted the danger. Chennai City FC tried to find the equaliser in the final stages of the game but the Aizawl FC defence remained impenetrable to leapfrog the Kolkata giants to the top of the table, at least for another three hours until the final whistle at the Shree Kanteerava Stadium. 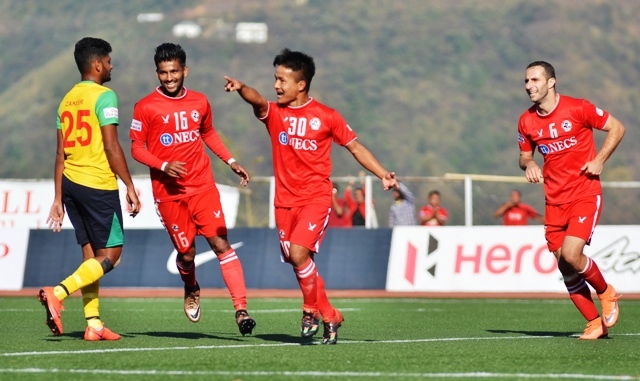 With three more points in the kitty, Aizawl FC now lead the table with twenty-three points from eleven matches. Chennai City FC stoop to the ninth position in the table with eight points from eleven matches. Aizawl FC look forward to hosting Mumbai FC on March 4, 2017 and Chennai City FC will lock their horns with DSK Shivajians at their backyard next day. The Indian League. Powered by Blogger.